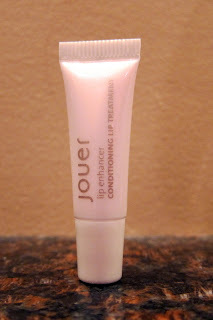 THE SKINNY: Jouer's Lip Enhancing Conditioning Lip Treatment is creamy and shiny. This clear lip conditioner is made with Vitamin E, Shea Butter and Jojoba Oil to help make lips soft and supple. It does a decent job, too. It felt ridiculous creamy on my lips and it lasted as long as the lipstick I paired underneath it. Jouer recommends that you use its Lip Enhancing Conditioning Lip Treatment three times a day for 29 days, and you will see fuller, more hydrated lips. My sample is way too small to last 29 days. If you have a full-size version of this product, let us know how it works. KEEP OR TOSS: Keep, although it won't last long. Jouer makes the smallest sample tubes I've ever seen. I'd put this in the too-expensive-to-buy-a-full-size category. CHECK IT OUT: This gloss is sheer with a slight pink tone. Read more about it on the Jouer website.